In pst-news10.pdf on page 3-4, the author introduces a new notation >A where A is a point of any type (whether a node or simply a literal (2,-1)). 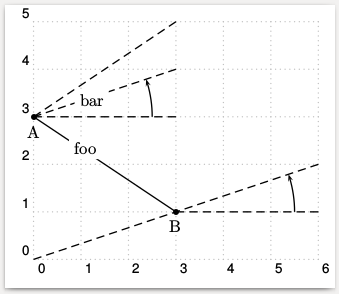 to change the behavior of \uput when a node is passed to its <direction angle> argument. Is there any usage of >A besides the case given above? In other words, does >A represent a new point derived from A? If yes, what kind of transformation applied on A to get the new >A? In case it is just for changing the behavior of \uput, does it more make sense to apply > on <direction angle> rather than <point>? There is no other case. It is only a special rotation for a node and will not be changed. How to make parentheses usable as macro delimiters when the macro is passed as a point in RPN notation? What is the drawback (if any) when loading pst-all? Why can the labelsep of \uput not work when represented in RPN? How does \uput determine the touching point between the object box and the hypothetical circle? Is there any compiler-dependent font loadable for pdflatex but not for latex-dvips-ps2pdf? How to cancel the effect of \translate when I want to draw a radial line from the untranslated origin to the current point? What is the meaning of starred angle for the third argument of \uput?